The weather here has been absolutely fantastic and so we’ve spent more time this weekend in the garden. And yes, we have brought back out the Swingball. 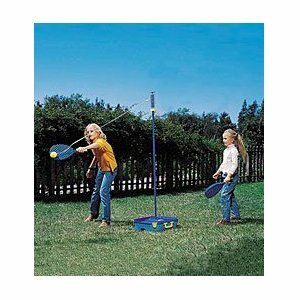 For the uninitiated, Swingball is a British Tether ball-style game, but uses a small tennis type ball and plastic tennis racket-shaped rackets. It’s certainly harder to hit than tether ball and is much easier to get hit (in the face, or the body) by said ball (especially in two-person games), but it’s great fun. We bought ours stateside on Amazon.com a couple of summers ago for about $30 and it’s been solid. Now I just need to buy a bottle of Pimms and summer can officially begin. Posted on 21, May 2012, in sports and tagged British, swing ball, tether ball. Bookmark the permalink. Leave a comment.